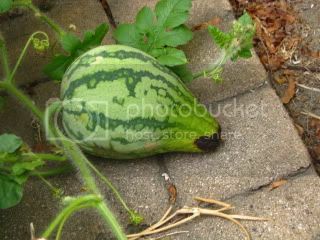 My wonderful watermelons were growing so great and now they have black ends like they are rotting inside. I don't have tons of room for them and they have grown across my bricks could the sun be heating the bricks and burning them? But what is strange is the spot that is touching the ground is fine its the ends that are burned/rottedd looking. Here are some pictures it seems like they are starting to get worse on the smaller ones too. The smaller ones I'm sure aren't save-able but the larger ones I hope are. I will be so diappointed if I don't get to eat any of them Does anyone have any idea what going on here? What can I do? If you type blossom end rot into the search box at the upper left of the page, you will find quite a few past threads where this has been discussed. 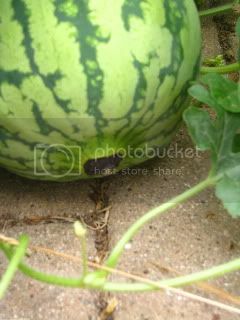 Clemson University offers this informative article, which includes a photo of a watermelon with blossom-end rot. Looks just like yours. Thank you for the info, I hope I can save at least the big one! If you add calcium to the soil, you should be able to salvage any fruit that aren't yet damaged. I seem to recall reading in one thread that you could spray the plant with a solution of 1 cup of milk mixed with 1 gallon of water. If you haven't done so yet, do a search and read through some of the older threads on the subject. Calcium deficiency is a situation that is relatively easy to treat. 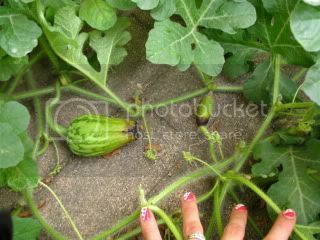 Brown Tendrils, but not ripe Black Diamond Watermelon?